Illinois law required motorists to carry a minimum amount of insurance while driving on our roadways. Currently, that amount for passenger vehicles is $20,000 per person/$40,000 per occurrence for injury. Semi-trucks are required to carry a minimum of $1,000,000 of liability insurance. Unfortunately, many passenger vehicles on the roads today are being driven without insurance covering the driver. When that driver is at-fault for causing an injury in an accident, there is no insurance coverage to pay the injured victims. A Chicago personal injury lawyer experienced in handling uninsured motorist claims is essential to the success of your case. That is why uninsured motorist coverage is so important. The amount of insurance coverage you carry on your automobile can make all the difference if you are injured by an uninsured motorist. Every auto insurance policy in Illinois has uninsured motorist coverage. That amount is the same amount as you carry for liability insurance, unless you specifically waived it at the time you purchased the insurance. For example, if you have $100,000 of liability insurance, you should also have $100,000 of uninsured motorist coverage. Many people carry umbrella insurance policies of $1,000,000 or more that provide excellent uninsured motorist coverage if they are injured by an uninsured motorist. Without adequate uninsured motorist coverage, getting in an accident with an uninsured driver can be a financial disaster. If you are involved in an accident with an uninsured driver, a skilled Chicago injury lawyer can make a claim against your own auto insurance carrier to recover damages for your injuries. At that point, your insurance company becomes our opponent in the case. Typically, uninsured motorist claims are handled through an arbitration process rather than filing a lawsuit in a circuit county court. Each auto insurance policy has specific conditions that must be met in order to proceed with the claim. 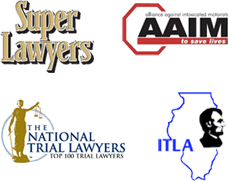 A Chicago injury lawyer experienced in handling uninsured cases is vital to the success of the case. Many people don't realize that if they are pedestrians or bicyclists and hit be an uninsured motor vehicle, it is possible to make a claim for uninsured motorist coverage on your own automobile policy or the policy of a relative that you live with. Many times, these types of claims are not pursued unless you hire a Chicago injury lawyer experienced in these types of issues.